I found the original version of this recipe on Epicurious.com but altered it since at the time I didn’t have whole cumin or caraway seeds on hand. 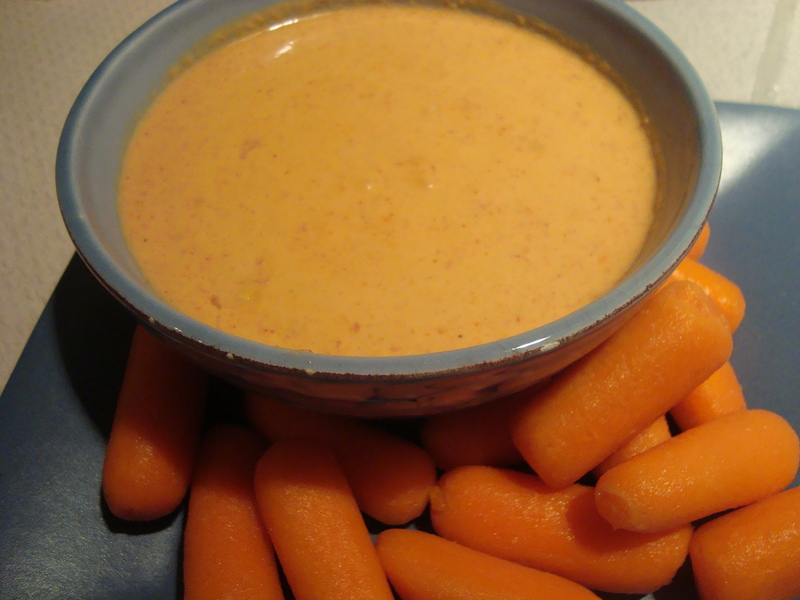 This Roasted Pepper and Garlic dip takes a little more work than some other dips, that are basically one step of throwing everything in a bowl and mixing it. For this dip you first oven roast a red pepper and garlic cloves. These roasted veggies are then blended with the remaining dip ingredient to create a lovely orange dip with a ton of flavor. Quarter bell pepper lengthwise and discard stem, seeds, and ribs. In a shallow baking pan arrange quarters skin sides up. Separate garlic cloves, leaving skins intact. Wrap together in foil. Add garlic package to pan with bell pepper and bake in upper third of oven 20 minutes. When cool enough to handle, peel pepper and transfer to a blender. Remove garlic from foil and squeeze pulp into blender. Add remaining ingredients to blender and puree until smooth. Serve with veggies such as carrot sticks, zucchini spears, fennel crudites, or celery sticks. Dip can be made 5 days ahead and chilled, covered. I altered a recipe from Bon Apetit’s Outdoor Entertaining cookbook by subbing veggie refried beans for the kind with bacon, upping the spices, and tweaking other ingredient amounts. The assembled dip looked bright and festive on the buffet table and received lots of comments from guests. Mix beans and chili powder in a medium bowl to blend. 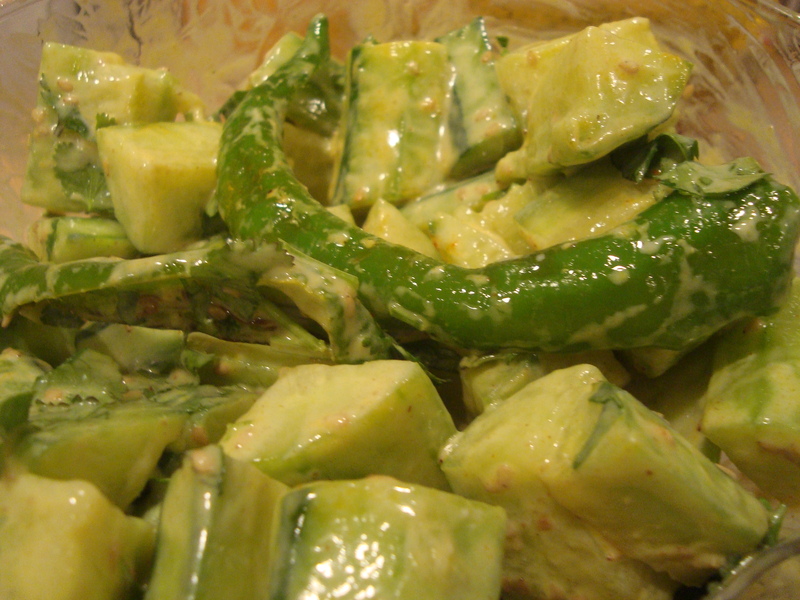 Mix guacamole, tomatillo salsa, and garlic in another medium bowl. Spread half of bean mixture in bottom of 8 – 10 cup glass bowl. Sprinkle with 1 cup of cheese. Spread guacamole mixture over. Spoon half of drained tomatoes over the guacamole. Spread remaining bean mixture over. Stir sour cream in container to loosen. Spread over bean mixture, covering completely. 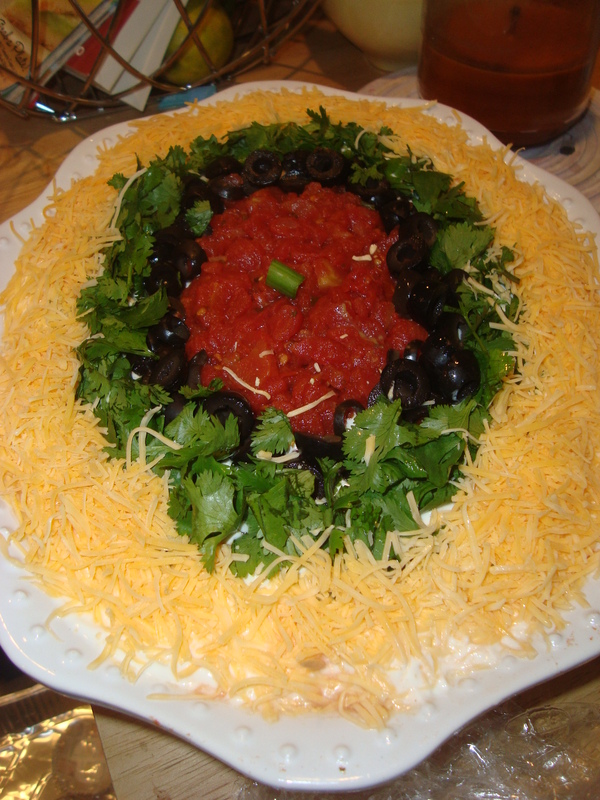 Arrange cilantro, remaining cheese, olives, and remaining drained tomatoes in concentric circles on top of the sour cream. NOTE: Dip can be assembled 1 day ahead. Cover tightly with plastic wrap and keep refrigerated. I am not sure if there is anything that much easier to make than cous cous. Basically it involves boiling water, stirring in some cous cous and removing from heat…waiting a few minutes and then fluffing the cous cous. 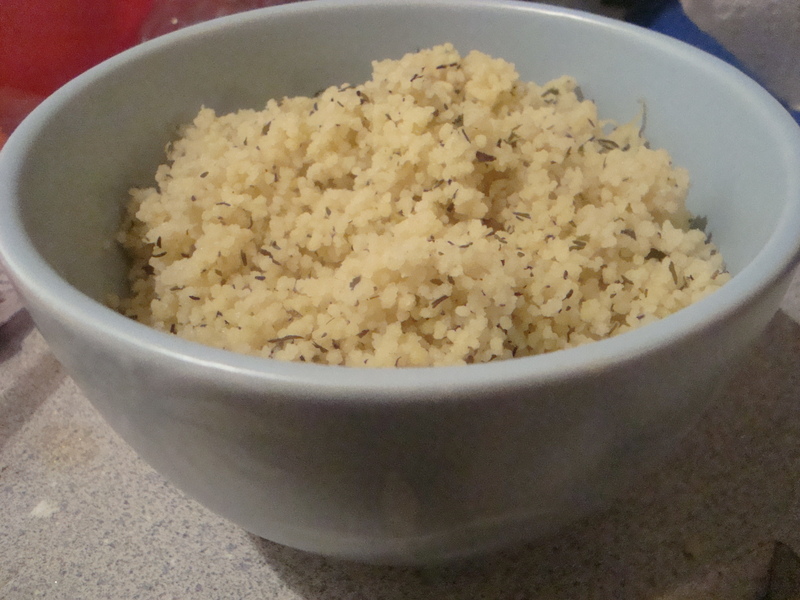 That being said, plain old cous cous can be kind of…well…plain. But it is so simple to add some flavor to cous cous. One way, is to add some ingredients to the water you cook the cous cous in. For this recipe chicken broth, lemon zest and fresh thyme are added. This cous cous makes a good accompaniment for a chicken stew. In a 2 to 2 1/2 quart heavy saucepan bring water, broth, thyme and zest to a boil. Cover pan and immediately remove from heat. Let couscous stand covered, 5 minutes. Fluff couscous with a fork and stir in oil and salt and pepper to taste. I am always on the lookout for tasty salads to serve alongside our meals. We eat a lot of Mediterranean or Middle Eastern fare, so when I spotted a recipe on Epicurious for a Greek salad with orzo, I had to try it out. Technically, this salad is not a true “Greek Salad” since authentic Greek salads don’t contain lettuce or vinegar. But, this is definitely a tasty spin on a Greek salad. So, if you are having a Greek Salad purist over for dinner, you may want to call this something else…how about Mediterranean Orzo Salad?? I altered this recipe from one on Epicurious.com since theirs actually had you assemble the recipe in mason jars. I didn’t see the point of me making it in mason jars just to dump it out immediately onto the plate… The salad is fairly simple to make and looks so colorful on the dinner table. My husband really enjoys this salad but ends up pushing most of the orzo to the side of his plate, since he is not a big orzo fan (what is there NOT to like about orzo?? ?…odd duck). This recipe makes enough to serve 4 as a main course or a crowd as a side dish. Cook orzo according to package instructions. Drain and rinse under cold water until cool. Drain well. Make a bed of romaine lettuce on a serving plate. 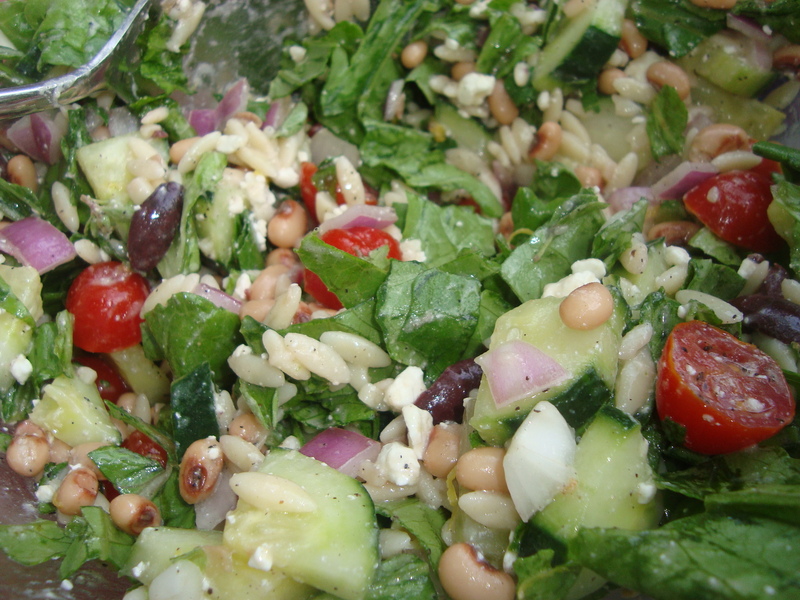 Spoon the orzo-black-eyed pea mixture on top of lettuce. Top with feta crumbles and peperoncini. Sia is one of the most played artists on my iTunes. So, yes, I listen to quite a bit of her music. Whenever I see sweet potatoes I always start singing this song in my head. I am a sweet potato fan, just like I am a Sia fan. MrMango thinks sweet potatoes are okay…not his favorite, but prepared the right way…he will eat them. I tried these oven roasted herbed sweet potatoes from a recipe I tore out of Gourmet. 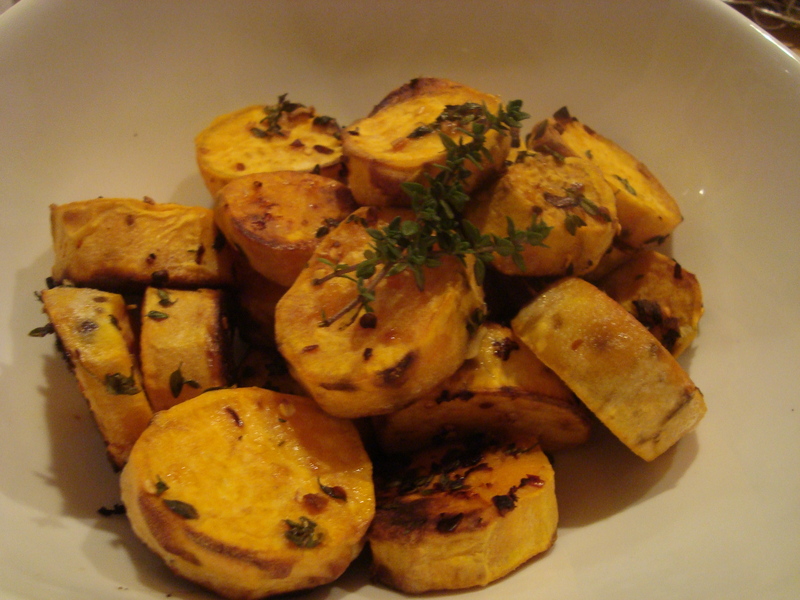 The thickly sliced sweet potatoes are tossed with olive oil, fresh thyme, garlic, coarse salt, and red pepper flakes. They were super easy to prepare and had a nice flavor profile with the sweetness of the potato, the saltiness, the savoriness of the herbs, and the kick of spice from the red pepper flakes. In large mixing bowl, combine all ingredients and toss. Arrange potato slices in single layer on heavyweight rimmed baking sheet or in 13×9-inch baking dish. Place on top rack of oven and roast until tender and slightly browned, about 40 minutes. Serve warm or at room temperature, garnished with thyme sprigs.